For an experienced quilter, putting together your quilt sandwich is just all part of the process, but I can tell you that even experienced quilters can occasionally learn something new. So let’s talk about the sandwich! First, if you don’t know, a quilt sandwich is nothing more than the pieced quilt top, the batting and the backing. The batting, obviously, is the meat of the sandwich, while the fabric top and back are the bread. And you build a sandwich so that you can quilt it! I am making an assumption before you start that you pressed your quilt top and backing and they are ready to go. If not take the time to press them before you start; the process will go much easier and faster. Now there are two schools out there on how to put it together. I have done both. The first I’ve had some success, but it never was completely to my satisfaction. The second method I’ve had much more success and it is now how I put all my quilt sandwiches together. Let’s talk dimensions before getting into the “how.” You have a pieced top which you can measure and know how long and wide it is. To ensure you have “wiggle” room, you want your batting to be 2” bigger all around. That means you will add 4” to the width and 4” to the length of the pieced top to determine the size of the batting layer. Likewise, your backing also should be 2” wider than your batting all around, so you again add 4” to the length and width of the batting to determine the size of the backing. If you have understood this so far, you probably already know that the backing is 8” longer and wider than the pieced top. Here’s some real numbers to help you solidify these measurements in your head. 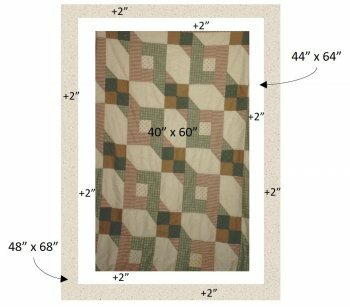 Say that your pieced quilt top is 40” x 60”. Your batting will be 2” longer and wider on each side, so adding 4” to each measure makes your batting size 44” x 64”. The backing is another 2” on each side, adding another 4” to the batting size (and 8” to the pieced top size) so it is 48” x 68”. For those who are more visual, here’s a picture created to illustrate the same thing. Now for the “how.” Using a surface that is large enough to lay the whole backing flat, lay the backing out right side down, wrong side facing up. Smooth out the wrinkles and then tape it using painter’s tape or masking tape to the surface. Place the tape about every 6” so that the backing does not shift or wrinkle as you work on top of it. Next, lay your batting on top of the backing, centered on the backing so that you have the allotted 2” overlap of the backing showing around the batting. Note that if possible, it helps to layout the batting the day before so that any wrinkles or fold lines in the batting relaxes and the batting lays flatter. I’m sure you can guess what the next step is… Lay the pieced top on the batting, centering it too so that you have the 2” overlap of the batting showing all around. Now you are at the point that you can baste your sandwich. It’s your choice. You can pin baste it using safety pins, or baste it with needle and thread. How you plan to quilt it may determine which you will want to do. Often times, a quilter will pin baste a quilt that will be machine quilted and hand-baste one that will be quilted by hand. It is up to you though which basting method you want to use. I will add one more note here on basting. If you are pin basting, you want to make sure that you are using non-rusting pins. For small projects, I will sometimes use my flower head pins, but for large projects, I use curved safety pins. I had a friend explain to me that curved safety pins are much easier to work with when basting the quilt sandwich because they are curved. I was too embarrassed to admit that I had inherited a project that had been basted with curved safety pins, and I thought they were “defective” so I threw them away. But she also shared with me that you do not close the pins until you have the whole sandwich pinned, making it easier to remove and reset the pins should you need to while working through the project. It is also a good idea to start basting in the middle and work out, regardless of the kind of basting you are doing. You basting should typically be 3” or 4” apart. Let me step back to laying out your backing. If you do not have table space or even floor space to layout your backing, don’t worry; there is another way to tackle it. Start by marking the middle of the fabric on both ends (whether it is lengthwise or widthwise doesn’t matter) of all three layers – backing, batting and the pieced top. Now lay the backing down wrong side up on a long table with the middle markings at about the center of the length of the table. Tape down the edges on the table as before, leaving the middle markings clearly visible. Next lay the batting on top of the backing, lining up the middle markings on both the backing and the batting, and keeping the 2”overlap on the backing on each end. Repeat the process for the pieced top, lining up the middle markings on all three layers and keeping the 2” overlap. At this point, you can check the overhang on each side of the table to ensure that the layers are all positioned correctly. Before moving on, it is best to baste the part that is on top of the table. When ready, remove the tape and reposition the sandwich on top the table. To avoid any “bumps” from the layers hanging down off the table, leave about 6” of the basted sandwich on the table. Again, tape the backing down to hold it while you work, smooth the batting and pieced top and baste. Repeat this as often as necessary until you have basted the whole sandwich. The second method is a bit unconventional but I’ve found it so easy that I prefer it over the first method. With this process, you start with the batting. Lay it out flat on your work surface and center your pieced top on it. Once you’ve smoothed it and worked out the bumps, roll it up – like you would a jelly roll. Are you scratching your head going “Hmmm…”? Now lay your backing down flat, and if you want, you can tape it down just as before. Next, place the roll of batting and pieced top on the backing with the straight edge of the roll about 2” in from the edge of the backing, and with about 2” in from the ends of the roll. I think you can guess what comes next – unroll it. Check for any bumps and smooth where needed. When you are finished, all three layers are lined up and ready for basting. One caveat here with this second method. This method works very well when you have a flat surface big enough to hold the whole sandwich. I do not believe that it would work so easily if you only have a long table. So if you can only work from a table, use the method I described earlier, marking the centers and lining them up as you set the layers. One last note – if you taking your project to someone else to quilt, check with the person who will be doing the work. Find out what he/she wants you to do to prepare your project for quilting, and what the quilter prefers to do himself/herself. Also check the size of the batting and backing to guarantee you won’t be delaying the work while you run out to get a bigger backing or batting. That’s all for now. Enjoy your sandwich making! Barb Bergquist along with husband, Ron, own A Block Away Quilt Shop. A dedicated quilter with more than 25 years of experience, she is now actively sharing her love of quilting through the work in her shop.